But Washington State does not have a DMV so what would that accomplish? I agree with the first part. Most people have no clue what a cafe racer should look like, because they come from an era of sport bikes and never had first hand experience with the Triumphs, Nortons, etc. But as far as the second part, you would be surprised. Pleasantly surprised. Right you are Kevin. Unfortunately, they are buried by all the crappy "cafe" bikes. That GSXR may be missing a few pieces, but it comes with a badass lock! I actually do like that thing, but it's priced 2x higher than a chopped up gixxer is worth. I bought a new one in '73 and it was also blue. One of my best friends bought one just like it and his brother had a '72. My roommate at the time had a '74. They are fun bikes! This 2006 Kawasaki ZX 636 came from state farm insurance company. It is sold with a clean title but has some salvage history. The title becomes salvaged after it is retitled by a new owner, typically. Pretty crappy how that works. They are selling the bike with title as-is. IE< owner wrecked bike, claimed it as salvage and never got a new title showing salvage status. Repo company that knows nothing about what they are selling. This one is interesting. 2013 CBR turned into 2007 due to frame swap, but it was laid down at "Barely over 25 mpg" and it comes with clean title. What about gear must be a new company "Alpine" AND wear guards!!! I have this beautiful leather Alpine jacket ready for its new owner. I bought it just a year ago for $450 and only wore it for only one summer. It is a size 48 (US) with a zip in liner. It does have the wear guards for your shoulder and arms made right into the jacket. If you have any questions send me an Email. This seems pretty legit. You could likely look up the engine # and verify it was a '13 engine. At least the guy/gal is honest. I don't doubt that part. What I question is how barely 25mph drop resulted in the need for a new frame. The bodywork seems cobbled together too. I am nitpicking here. I had a frame dented when I was hit by a truck under 20mph. The part that dented was the side that hit the ground - not the side that the truck hit. 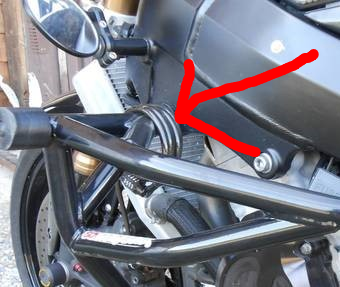 In my particular case from what we could tell, the bike must have landed entirely on the little bit of exposed frame. The rest of the bike was hardly touched (no cracked plastics, just scratches). Agree on the body work. Looks like he got Ebay special plastics.